Queen Bee – picture from 6cbatnist.wordpress.com. We were excited to open up the hive again to see how the bees were taking to our new frames and also to look for eggs with renewed vigor. What we found surprised us. Looking for eggs: We aggressively and meticulously hunted for eggs in our frames. Frame after frame, we couldn’t find any. We knew they were hard to find, but during the last inspection at least we found a few. We were going through our standard inspection, removing the queen cells as we found them. Always before, they were empty. This time, we found larvae in the queen cells. 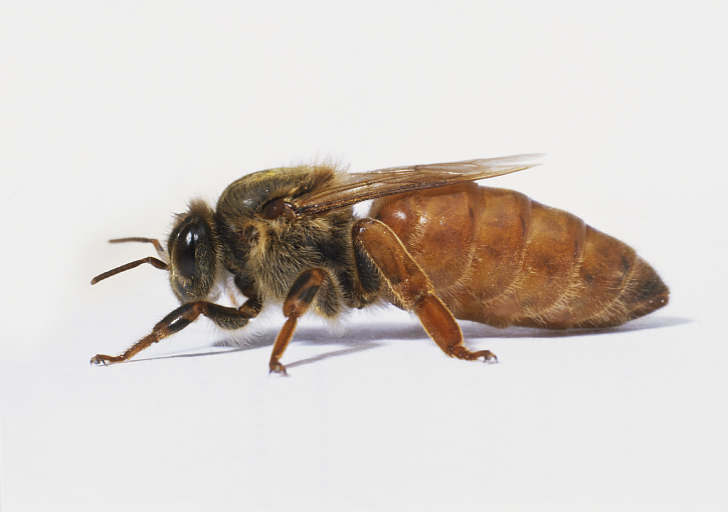 Queen Bee – picture from johnfield.org. It should have occurred to us earlier, but by the last box, we still had found no eggs and there were several queen cells with larvae. Our queen was no longer laying eggs! This felt like a DUH moment. We actually needed the hive to make a new queen and our normal default action was to keep the hive from making a new queen. We suddenly stopped in our tracks and realized that we needed to stop destroying the queen cells. 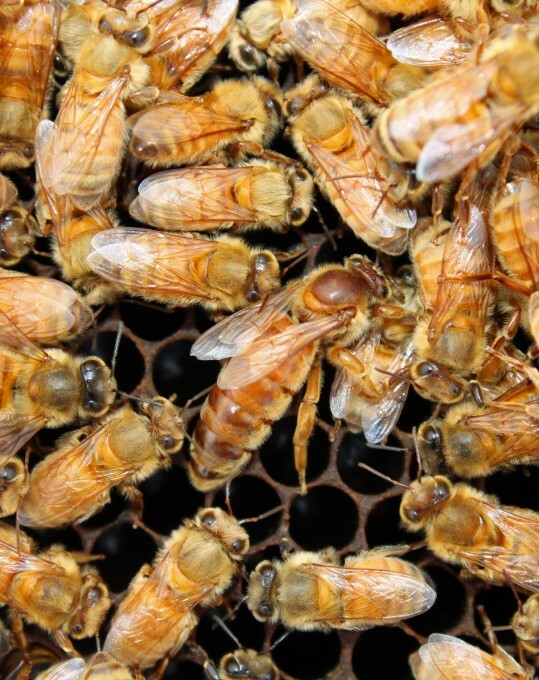 Any other queen cells that we found would be left intact. We continued our search for eggs. We didn’t find any eggs and found two more queen cells that we left alone. Whew! At least there were two queen cells, hopefully filled with larvae, left. Queen bee surrounded by worker bees. Picture from beeinformed.org. We called our mentor Jim and he agreed with our assessment. He went over the two ways that we can get a new queen. You can purchase one from the Apiary store or you can let the hive make one by leaving the queen cells. He said “keep the two best queen cells.” Well, since we destroyed all but two, we’ll have to take what we get. He said that it’s not good for the hive to have more than two as you could still have the hive swarm if they create too many queens. With the hive producing two queens, if both emerge, then the queens will fight over the hive and only one will survive. Queen cell – picture from lovelygreens.com. 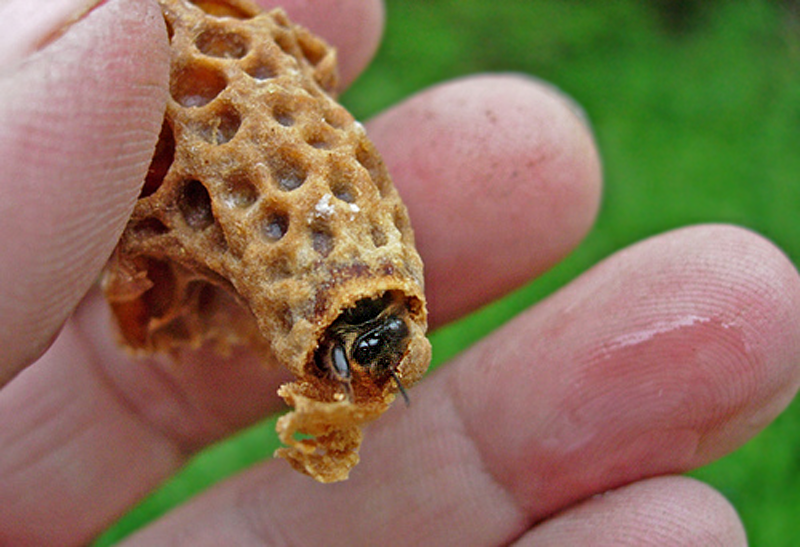 Here is a picture of the peanut-like queen cell with a queen emerging. So now we are in a wait and see state. We are waiting to see if a new queen is produced by the hive. The survival of the hive depends on it. It’s all about the queen. 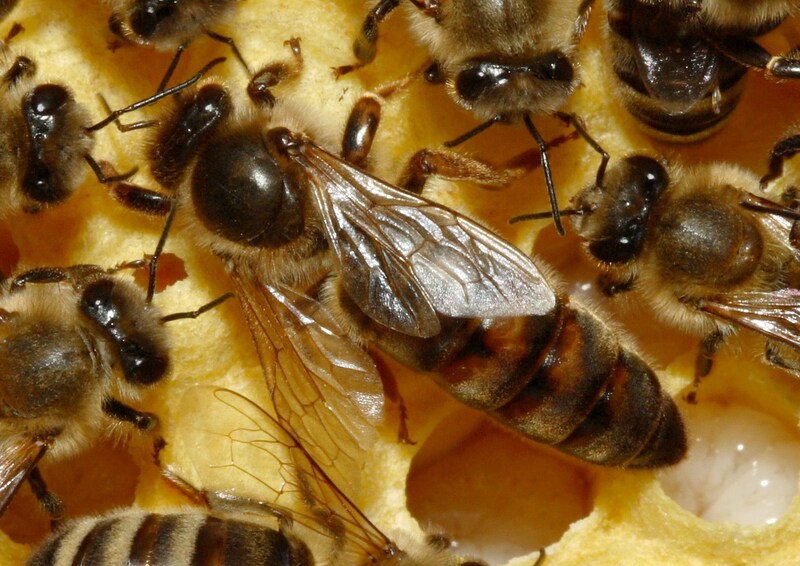 Gallery | This entry was posted in Bees and tagged Beekeepers, Beekeeping, Bees, Queen Bee. Bookmark the permalink.